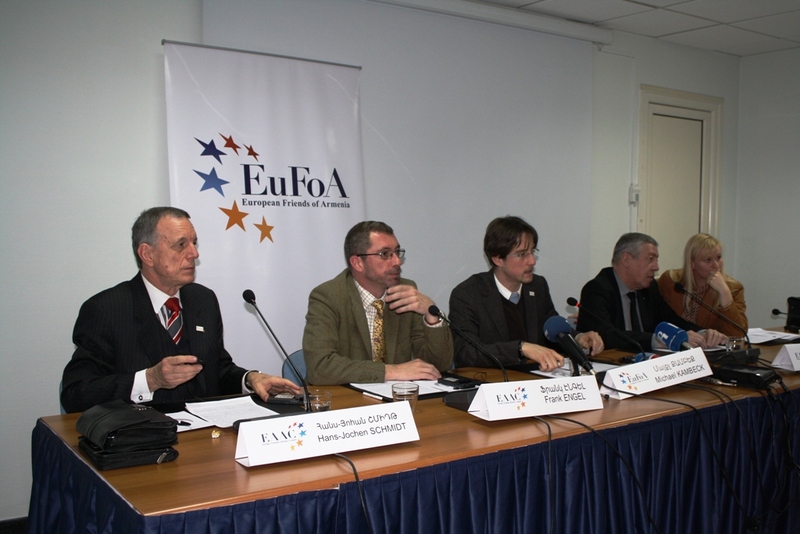 On 15 February 2013 several members of the European-Armenia Advisory Council (EAAC) held a press conference in Yerevan and presented the Council’s Call for free and fair presidential elections in Armenia on 18 February 2013. The event was widely covered by Armenian media (see links below). During the press conference Mr Frank Engel, Member of the European Parliament, Mr Hans-Jochen Schmidt, former Ambassador of the Federal Republic of Germany to Armenia, and Mr Francois Rochebloine, member of the National Assembly of France, stated that a proper conduct of presidential elections will improve Armenia’s image and will make it an attractive and advanced partner of the EU. The EAAC members claimed that a proper conduct of the elections will have its positive impact on the conclusion of negotiations for the Deep and Comprehensive Free Trade Area Agreement during the Eastern Partnership summit in Vilnius in November 2013, thus playing a crucial role for the country’s promising future on its European path. The Europe-Armenia Advisory Council was created by European Friends of Armenia; it is a unique body to promote relations between Europe and Armenia from the European side. Please click here to learn more about the Council.